This webinar will show how to set up a model in a realistic environment and assign materials in an easy way, using VSR Realtime Renderer 4.0.3. Variants of material assignments, environments and views will be created and restored with single mouse clicks. A preview of VSR Shape Modeling 3.0 Beta will be shown, demonstrating that it is possible to model geometry in such an environment in real time. Do not miss it! A tutorial for VSR Realtime Renderer is now available. Learn to quickly and easily put your model on stage. Get to know the possibilities and methods of creating photorealistic renderings in no time at all, with simultaneous modeling of the 3D model data. Optimize the visualization process by using special features such as glow effects and ray tracing. Use the variant manager for model presentations and the VSR iView App for mobile communication with the Apple world. 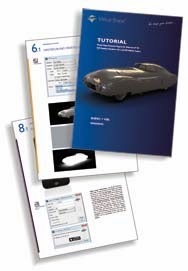 The tutorial is available to registered users in the download section.